The visible light spectrum is the segment of the electromagnetic spectrum that the human eye can view. More simply, this range of wavelengths is called visible light. Typically, the human eye can detect wavelengths from 380 to 700 nanometers. All electromagnetic radiation is light, but we can only see a small portion of this radiation—the portion we call visible light. Cone-shaped cells in our eyes act as receivers tuned to the wavelengths in this narrow band of the spectrum. Other portions of the spectrum have wavelengths too large or too small and energetic for the biological limitations of our perception. As the full spectrum of visible light travels through a prism, the wavelengths separate into the colors of the rainbow because each color is a different wavelength. Violet has the shortest wavelength, at around 380 nanometers, and red has the longest wavelength, at around 700 nanometers. (Left) Isaac Newton's experiment in 1665 showed that a prism bends visible light andthat each color refracts at a slightly different angle depending on the wavelength of the color.Credit: Troy Benesch. (Right) Each color in a rainbow corresponds to a different wavelength of electromagnetic spectrum. The Sun is the dominant source for visible-light waves our eyes receive. The outer-most layer of the Sun's atmosphere, the corona, can be seen in visible light. But it is so faint it cannot not be seen except during a total solar eclipse because the bright photosphere overwhelms it. 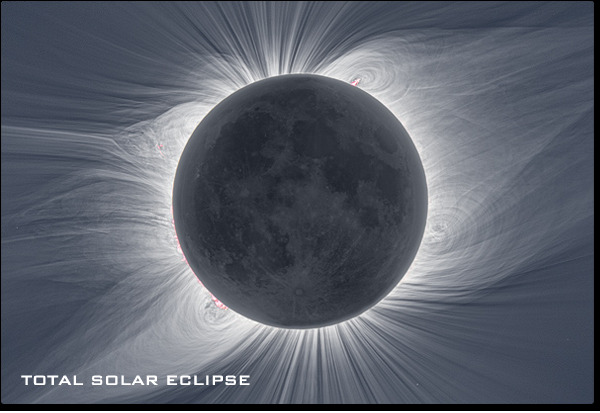 The photograph below was taken during a total eclipse of the Sun where the photosphere and chromosphere are almost completely blocked by the moon. The tapered patterns—coronal streamers—around the Sun are formed by the outward flow of plasma that is shaped by magnetic field lines extending millions of miles into space. As objects grow hotter, they radiate energy dominated by shorter wavelengths, changing color before our eyes. A flame on a blow torch shifts from reddish to bluish in color as it is adjusted to burn hotter. In the same way, the color of stars tells scientists about their temperature. 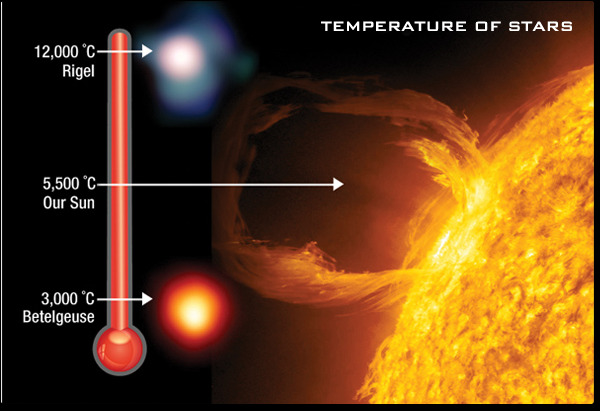 Our Sun produces more yellow light than any other color because its surface temperature is 5,500°C. If the Sun's surface were cooler—say 3,000°C—it would look reddish, like the star Betelgeuse. If the Sun were hotter—say, 12,000°C—it would look blue, like the star Rigel. Isaac Newton's experiment in 1665 showed that a prism bends visible light and that each color refracts at a slightly different angle depending on the wavelength of the color. Close examination of the visible-light spectrum from our Sun and other stars reveals a pattern of dark lines—called absorption lines. These patterns can provide important scientific clues that reveal hidden properties of objects throughout the universe. Certain elements in the Sun's atmosphere absorb certain colors of light. These patterns of lines within spectra act like fingerprints for atoms and molecules. Looking at the Sun's spectrum, for example, the fingerprints for elements are clear to those knowledgeable about those patterns. Patterns are also evident in a graph of an object's reflectance. Elements, molecules, and even cell structures have unique signatures of reflectance. A graph of an object's reflectance across a spectrum is called a spectral signature. 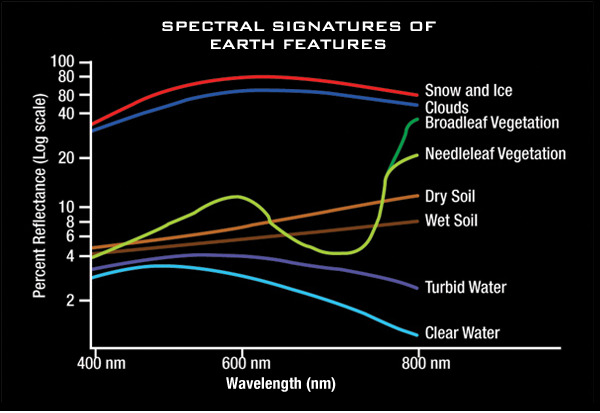 Spectral signatures of different Earth features within the visible light spectrum ARE shown below. 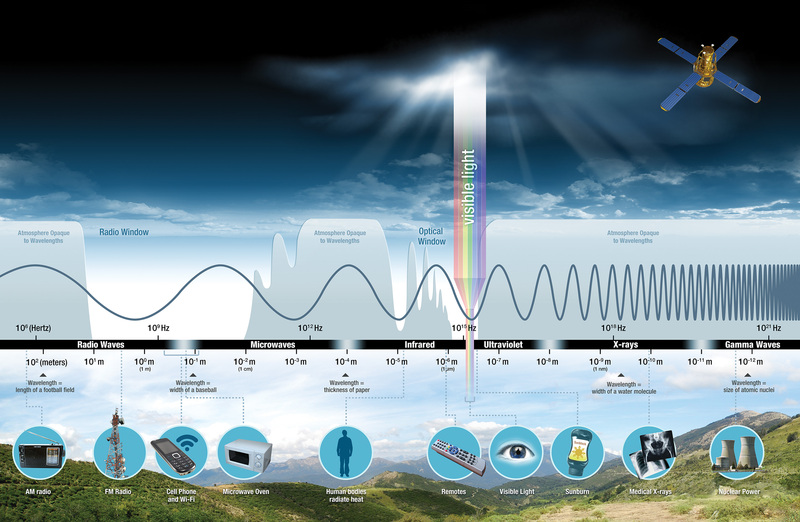 Laser altimetry is an example of active remote sensing using visible light. 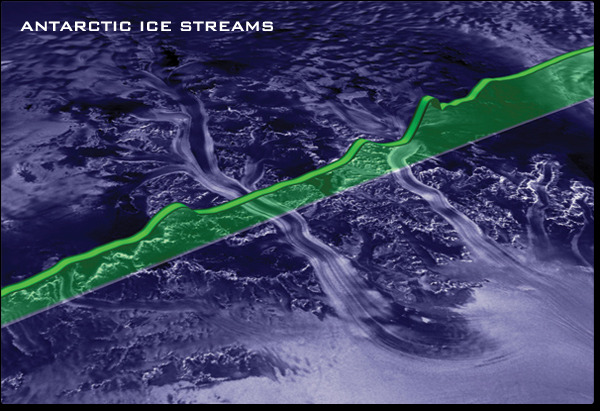 NASA's Geoscience Laser Altimeter System (GLAS) instrument onboard the Ice, Cloud, and land Elevation Satellite (ICESat) enabled scientists to calculate the elevation of Earth's polar ice sheets using lasers and ancillary data. Changes in elevation over time help to estimate variations in the amount of water stored as ice on our planet. The image below shows elevation data over the West Antarctic Ice Streams. Laser altimeters can also make unique measurements of the heights and characteristics of clouds, as well as the top and structure of the vegetation canopy of forests. They can also sense the distribution of aerosols from sources such as dust storms and forest fires.